It’s time to learn to drive! Being ready for Drivers Ed might be scary, but ease your nerves a bit and enroll through Southern Lakes Parks & Recreation. *All classes are Monday and Wednesday, except the first and last week. The first week meets Monday and Tuesday. The last week meets Monday and Thursday. QUALIFICATIONS: To enroll, students must be at least 14 years 8 months of age on the first day of class. To Complete Segment 1: Students must pass both the written state test and the driving portion of the course. Students are allowed to re-test twice, and may re-take the course once without paying again if they do not pass. REGISTRATION/PAYMENT: Registration and payments can be done online at www.slpr.net or in our office at the Fenton Community & Cultural Center. *REGARDLESS OF REGISTRATION METHOD (ONLINE OR IN-OFFICE) ALL STUDENTS MUST SUBMIT THE SEGMENT 1 STUDENT CONTRACT (THIS IS THE PAPER REGISTRATION FORM WHICH CAN BE FOUND BELOW) AS WELL AS A PAPER COPY OF THEIR BIRTH CERTIFICATE. To register for Driver’s Training, you can register online but, need to completely fill out Drivers Education paperwork, and bring a copy of the child’s birth certificate. You must submit that paperwork to the SLPR office at the Fenton Community Center, to secure a place in class. To print the Drivers Training paperwork, please click here. * QUALIFICATIONS: To enroll, students must present a driving log of at least 30 hours of supervised driving (including 2 hours at night) with your parent, guardian, or designated adult. You must have held your Level 1 License (permit) for at least 3 consecutive months (a minimum of 90 days from the date indicated on the permit). * TO COMPLETE THE COURSE: Students must pass the written state test. Students are allowed to re-test twice, and may retake the course once without paying again if they do not pass. 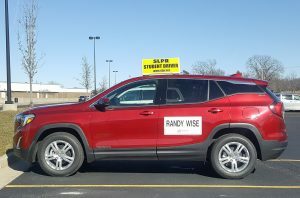 Thank you Randy Wise Buick-GMC of Fenton for providing the cars for Driver’s Education! Randy Wise Buick GMC along with Southern Lakes Parks & Recreation provided $3,000 worth of scholarships to local students graduating in 2018. These students will be entering the automotive field. Thank You Randy Wise for your continued Partnership in giving back to our community.